We are doing all types of injection moulding in all types of plastic as per the requirement of our customers. 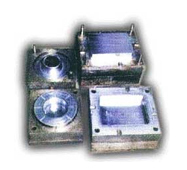 We make the precision moulds ourself and then do the injection or blow moulding in all types of plastic like ABS, PP, HIPS, NYLON, etc. Some of the products which we have developed includes plastic Bezel for work lamps, plastic connectors for charging of electric vehicles, tail lamps charger parts , plugs, connectors, mud guards etc.